This is the first year we’ve grown kale, and I must say it has done surprisingly well. Early this spring I had a problem with it being eaten by grasshoppers and worms, but once we got past that stage it was smooth sailing. Now we can harvest as much as we can eat! We put it in everything from smoothies and stir-fry to soup and lasagna. Every now and then I make kale chips for us to snack on. It was starting to slow down its growth with the hot weather we’ve had lately, so I harvested a whole lot. I blanched it in boiling water and froze it to use this winter! These are so easy to make and you can customize them for your palate! 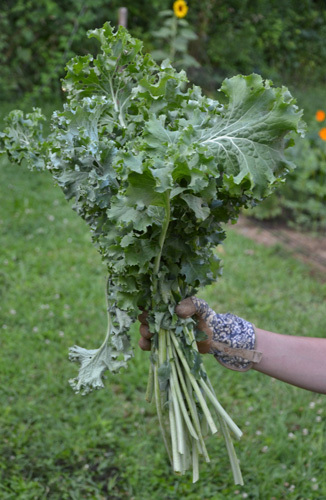 Wash your kale and tear it into pieces about 2-3 inches large. Mix a little bit of olive oil, a little lemon juice, sesame seeds, and salt and pepper in a bowl. Massage the oil mixture into the kale before spreading it out on a baking sheet. Bake at 200 until the chips get dehydrated and crispy – usually 30 minutes to an hour – stirring occasionally. Store uneaten chips in the refrigerator and eat within one week. This entry was posted in Food and Drink, Garden, Recipe by Ashley. Bookmark the permalink.